43.60 mm satin-brushed grey ceramic case, 13.83 mm thick, sapphire back, unidirectional grey ceramic bezel with blue ceramic insert and Liquidmetal hour-markers, blue dial, calibre 1315 self-winding movement with date and seconds, approximately 120 hours of power reserve, blue NATO fabric strap, pin buckle. Water resistant to 30.00 bar. 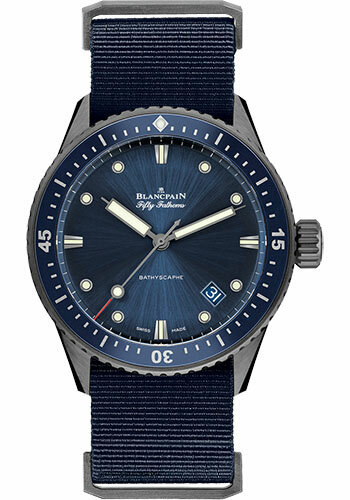 43.60 mm satin-brushed grey ceramic case, 13.83 mm thick, sapphire back, unidirectional grey ceramic bezel with blue ceramic insert and Liquidmetal hour-markers, blue dial, calibre 1315 self-winding movement with date and seconds, approximately 120 hours of power reserve, blue sail-canvas strap, pin buckle. Water resistant to 30.00 bar.